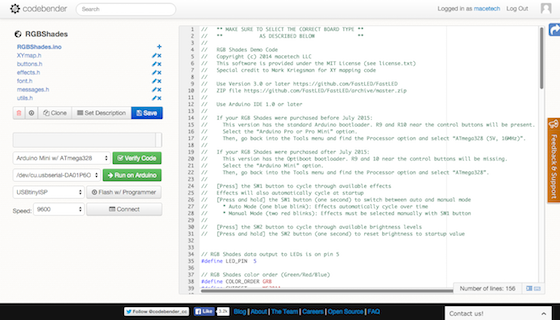 Now we're ready to start writing code! Under the name of the project, there is a list of files in the project. Click on the "effects.h" file and scroll to the bottom. The effects.h file is where we keep the code used for actually drawing the pixel effects. The rest of the files are mostly used for helper functions and data storage. The "startup tasks" section should be included at the beginning of every effect pattern. It is run once after switching from a different pattern, and can be used to set up variables like "effectDelay" which sets (in milliseconds) how frequently this pattern should be activated. 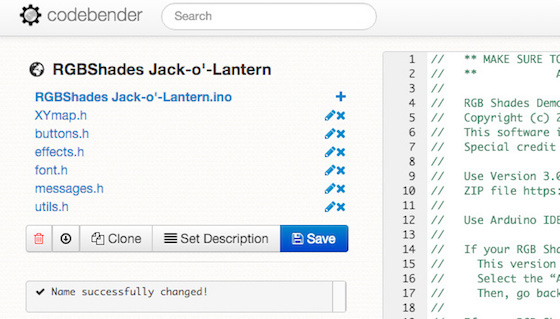 We still have some code to write, so let's add the actual shape of the jack-o'-lantern's eye. We're using a few bytes to create a binary bitmap of the shape we want. The RGB Shades are 16 pixels wide, so a 5-byte-tall bitmap can cover half the array. We'll mirror this later in order to fill the whole array. This code still doesn't do anything, so let's try writing something to the LEDs and give it a try. We will add flickering later, but before getting too deep it's a good idea to test each stage. The code above steps through each of the 5 rows of LEDs. 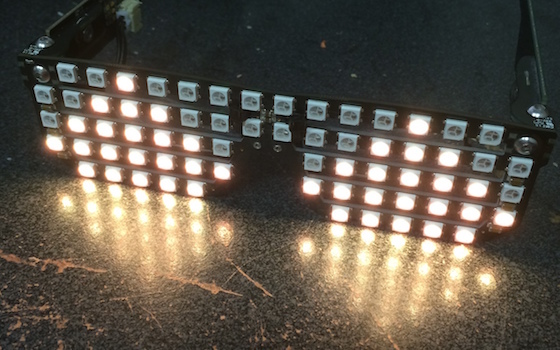 On each row, it steps through 8 LEDs, and checks the corresponding bit in pumpkinBitmap. If it's 1, then it'll set the color to orange. Otherwise, it'll set the color to black. 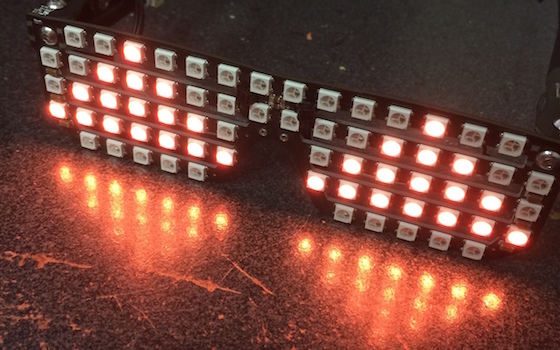 The pixels are written to the LED array using a mapping function, once for the first half of the array and again for the mirrored half of the display (mirrored simply by subtracting the current LED x-coordinate from the maximum x-coordinate). Let's upload this to the RGB Shades and see how it looks! It's a little more complicated, but not by much. We've added an intermediate value to store a brightness-adjusted color we call flickerOrange. This color is scaled by the flickerBrightness value. We've set some upper and lower bounds on flickerBrightness, and on every run through we grab a pseudorandom value, subtract half the expected range of random values, and add the resulting number to flickerBrightness. Since flickerIncrement can be positive or negative (or zero) it will randomly move the brightness up and down in varying size steps. The result is pretty similar to a wind-blown candle dimming and brightening but never going completely out. One last thing...we left all the other effects in effectList, and autoCycle is enabled. You can simply hold down the mode-select button to stop auto cycling. But if we want to start up in pumpkin mode and not change unless we tell it to do so, we have to turn off auto cycling. In the "utils.h" file, there is a line "boolean autoCycle = true;" which when changed to "boolean autoCycle = false;" will start the RGB Shades in manual mode. That's all there is to it! If you're familiar with programming, you should be able to make new patterns pretty easily within the existing code structure for the RGB Shades. If you still need to learn, we hope this guide helped you get started.